See also Underground C by Dmitriy Sychiov (Sychoff). 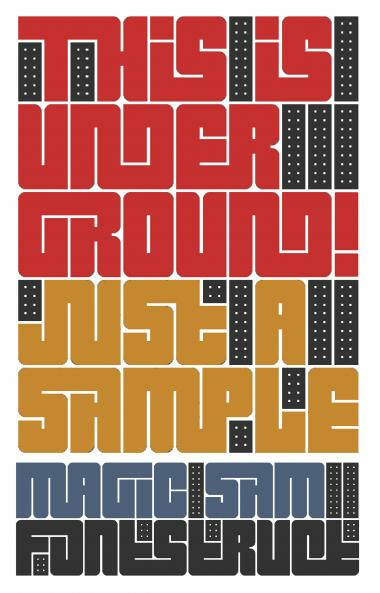 If you want to create cool Letterings, try Underground! This was inspired by Pincoya Black Type by Daniel Hernandez. You can write letter by letter using the Uppercase or you can connect every character using the alternates. Please take a look at the example, then you´ll understand the idea! Lowercase are alternates of the same letter or a different letter. >=alt.B, <=alt.D, @=alt.T Underline:=+, Overline=*, Filter: 1,6. Info: Created on 3rd September 2009 . Last edited on 11th September 2009. Although it's clearly over the top. It reminds me of Grand Theft Auto (no, i don't play it... anymore), but I didn't know about Pincoya. Inspiring indeed. Do you think similar diacritics might be possible with this one? I just have a few problems with this Fontstruction, it seems to be impossible to adjust the letter width feature at 0. If I can´t fix this the font will need a bit of manual spacing...hm. Even though I like Pincoya's diacritics because of the inlaid positioning, yours add more funkiness to the style. dig it! I have had the same problem, even though you can type your input in the Filter Tool, in the LWT you can only use the sliders. Maybe it's something really simple like a true or false statement overlooked. I cross my finger on that one. Nice work, I like the ligatures very much. But you might want to standardize the diacritics corners : some are round, others square. @Igorrossi: That´s because some of them are accents (ú,í) and some just dots (ö,ä,i). I noticed that some of the alternates seem to be misplaced ... U and K come to mind. @p2pnut: You´re right about the alternates. I corrected them. A really nice heavy and funky font. It's everyday harder to make a typeface that looks original, is natural. Then, you most to add some little smart thing on it, and you got it. I just corrected letter width on one my FSions. Congratulations! FontStruct Staff have deemed your FontStruction worthy of special mention. “Underground” is now a Top Pick. @FS-Staff: Thanks! But there is one thing that makes me go crazy. It seems possible to adjust the Letter Width Tool at 0 (LWT = vertical Baseline); in this case "Underground" would work properly. 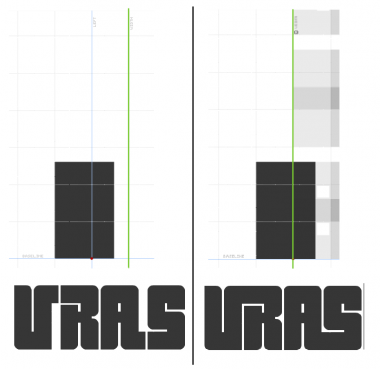 But everytime I save & quit the Fontstructor the LWT is back at one brick width. Argh! I don´t know if this was intended to be so or if it´s a bug, but please change it! I just tested to make sure, and it works for me. Maybe you have a non-zero global spacing value in Preview > Advanced > Spacing? Do you have the same problem with other glyphs and other FontStructions? @gustavo: That´s mysterious. I tried different browsers, different computers and different fontstructions, but it didn´t function. I changed the global spacing to -1 and then adjusted every single character by hand. It works! Yeah. I love the way how letters overlap to form connected ligs. Extra niceness.